Astatine element 85 Segre etc in Chemical Journal Don [Gilbert?] 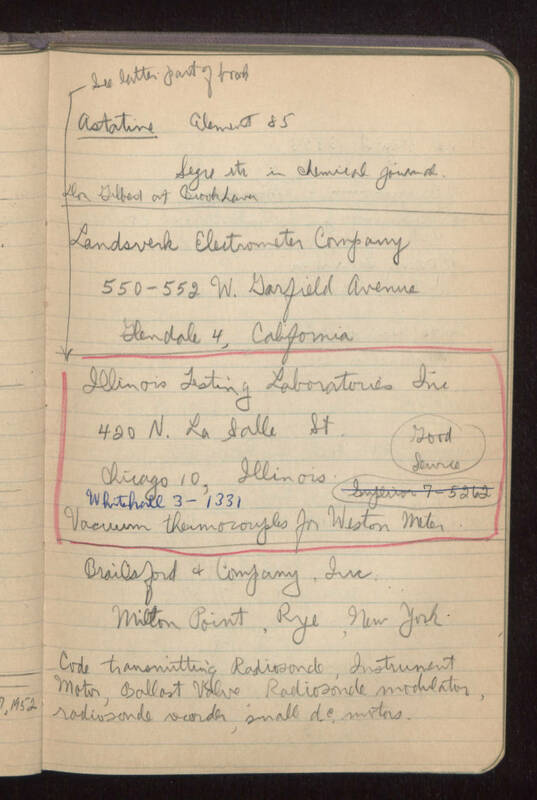 at Brookhaven ---------------------------------------------- Landsverk Electrometer Company 550-552 West Garfield Avenue Glendale 4, California ----------------------------------------------- See latter part of book: [red pencil boxed below here:] Illinois Testing Laboratories Inc. 420 North La Salle Street Chicago 10, Illinois [phone:?] Whitehall 3-1331 [crossed out: [phone:?] Superior 7-5262] vacuum thermocouples for Weston meter good source [red pencil boxed above here] --------------------------------------------------------- Brailsford and Company, Inc. Milton Point, Rye, New York Code transmitting Radiosonde, Instrument Motor, Ballast Valve Radiosonde modulator, radiosonde recorder, small d.c. motors.